The many astounding coincidences of Obama…..
Obama just happened to know 60′s far-left radical revolutionary William Ayers, whose father just happened to be Thomas Ayers, who just happenedto be a close friend of Obama’s communist mentor Frank Marshall Davis, whojust happened to work at the communist-sympathizing Chicago Defender with Vernon Jarrett, who just happened to later become the father-in-law of Iranian-born leftist Valerie Jarrett, who Obama just happened to choose as his closest White House advisor, and who just happened to have been CEO of Habitat Company, which just happened to manage public housing in Chicago, which just happened to get millions of dollars from the Illinois state legislature, and which just happened not to properly maintain the housing—which eventually just happened to require demolition. Bernardine Dohrn just happened to be married to William Ayers, with whom she just happened to have hidden from the FBI at a San Francisco marina, along with Donald Warden, who just happened to change his name to Khalid al-Mansour, and Warden/al-Mansour just happened to be a mentor of Black Panther Party founders Huey Newton and Bobby Seale and a close associate of Nation of Islam leader Louis Farrakhan, and al-Mansour just happened to befinancial adviser to a Saudi Prince, who just happened to donate cash to Harvard, for which Obama just happened to get a critical letter of recommendation from Percy Sutton, who just happened to have been the attorney for MalcolmX, who just happened to know Kenyan politician Tom Mboya, who just happened to be a close friend of Barack Hussein Obama, Sr., who just happened to meet Malcolm X when he traveled to Kenya. Although no one had ever heard of him at the time, Obama just happened to receive an impossible-to-believe $125,000 advance to write a book about race relations, which he just happened to fail to write while using the cash to vacation in Bali with his wife Michelle, and despite his record of non-writing hejust happened to receive a second advance, for $40,000, from another publisher, and he eventually completed a manuscript called Dreams From My Father, which just happened to strongly reflect the writing style of William Ayers, who just happened to trample on an American flag for the cover photograph of the popular Chicago magazine, which Obama just happened never to see even though it appeared on newsstands throughout the city. In 1996 Obama ran for the Illinois State Senate and joined the “New Party,” which just happened to promote Marxism, and Obama was supported by Dr. Quentin Yong, a socialist who just happened to support a government takeover of the health caresystem. In late 1999 Obama purportedly engaged in homosexual activities and cocaine-snorting in the back of a limousine with a man named Larry Sinclair, who claims he was contacted in late 2007 by Donald Young, who just happened to be the gay choir director of Obama’s Chicago church and who shared information with Sinclair about Obama, and Young just happened to be murdered on December 23, 2007, just weeks after Larry Bland, another gay member of the church, just happened to be murdered, and both murders just happened to have never been solved. In 2008 Sinclair held a press conference to discuss his claims, and just happened to be arrested immediately after the event, based on a warrant issued by Delaware Attorney General Beau Biden, who just happensto be the son of Joe Biden. In the 2004 Illinois Democrat primary race for the U.S. Senate, front-runner Blair Hull just happened to be forced out of the race after David Axelrod just happened to manage to get Hull’s sealed divorce records unsealed, which just happened to enable Obama to win the primary, so he could face popular Republican Jack Ryan, whose sealed child custody records from his divorcejust happened to become unsealed, forcing Ryan to withdraw from the race, which just happened to enable the unqualified Obama to waltz into the U.S. Senate, where, after a mere 143 days of work, he just happened to decide he was qualified to run for President of the United States. 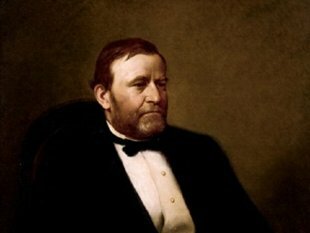 10 fascinating facts about President Ulysses Grant……. Ulysses Grant has a unique role in American history, as a military leader who later become president in one of the nation’s most troubled decades. Here are 10 things you might not know about him—including who is really buried in his tomb. 1. Ulysses wasn’t his real first name. Hiram Ulysses Grant was stuck with the name Ulysses S. Grant due to a mistake on his application form to West Point. And as with President Harry S. Truman, the middle initial “S” doesn’t stand for anything. But having the name “U.S.” Grant gained Hiram the nickname “Sam”–as in Uncle Sam–among soldiers. 3. Grant and Lee served in the army during the Mexican War. Lee was the chief of staff for General Winfield Scott, while Grant served under General Zachary Scott. Both men received high marks from their superiors. 7. Grant tried to annex the Dominican Republic to the U.S. The president wanted the Dominican Republic in the Union for several reasons: as a military base, as a sanctuary for freed slaves, and as a market for U.S. goods. The treaty was approved by the Dominicans, but stalled in the Senate. Grant’s fight with Senator Charles Sumner divided the Republican party. 8. Grant’s two terms in office had lots of drama. As president, Grant’s terms in office were a roller coaster. In addition to the fight over the Dominican Republic, Grant had to grapple with corruption, numerous scandals within his own administration, an economic disaster (the Panic of 1873), the 15th Amendment, Reconstruction, the Ku Klux Klan, and the threat of war with Great Britain and Spain. 10. OK, so who is really buried in Grant’s tomb? That’s a trick question. Grant and his wife, Julia, are interred inside the tomb, but their crypt is above ground. It is the largest mausoleum in North America. A federal judge has a message for President Obama: Stop bypassing Congress on immigration. Obama issued a directive in June 2012 halting the deportation of many young illegal aliens after Congress refused to pass the DREAM Act, which would have provided conditional permanent residency to young illegals. A federal judge in Dallas is now threatening to reverse that directive. U.S. District Judge Reed O’Connor said Tuesday that he will likely rule in favor of a lawsuit seeking to overturn the new policy. He has asked both sides to file additional arguments by May 6. The administration’s policy directs U.S. Immigration and Customs, or ICE, agents to defer deportation for illegal aliens under 30 who entered the country before the age of 16, are in school or have a high school diploma, haven’t been convicted of a felony, significant misdemeanor or multiple misdemeanors and are not a threat to public safety or national security. The ICE agent union challenged the policy, arguing that the Obama administration is disciplining agents who enforce federal immigration law. The president of that union, the National Immigration and Customs Enforcement Council, also said the policy is being abused. While critics argue the policy is ineffective in securing the border, Judge O’Connor indicated it’s also illegal for the Obama administration to tell immigration agents not to arrest an illegal alien who is a low priority. “The court finds that DHS (Department of Homeland Security) does not have discretion to refuse to initiate removal proceedings,” Judge O’Connor wrote. O’Connor issued a court order stating that Congress, not the president, sets priorities for arresting illegal aliens and that the law requires them to face deportation.